After Quepos we decided to spend a few days in Uvita Costa Rica. A small town, a very small town, on the coast. We booked our accommodation at what looked like a very highly recommended hostel. The only concern we had was this was the first place we would go with a 'shared bathroom'. Uvita is a great place to hang out, meet other interesting visitors and have interesting conversations over a wide range of subjects. We took a local bus and although it is a short distance it took about two hours. Two reasons – it stopped at nearly every bus stop to either drop off or pick up passengers and it detoured through some very rough roads. Rough rocky roads with fine powder dust are a common feature throughout Costa Rica. It was a hot day and the bus was not air conditioned but with the windows open was tolerable. When we got off the bus we could not see a taxi and the sun was beating down. We took refuge in the first bakery (turned out to be the only bakery) in town. There are very few registered taxis in Uvita and it appears that if locals are going in your direction they become taxis at the standard rate of $4 a ride. As we left the bakery after an empanada and coffee a "taxi" pulled up and offered us a lift to our hostel. Casa Nativos turned out to be one of the most pleasant places that we have stayed at on our travels. The rooms are small but the common areas (kitchen, sitting areas and kitchen) promote guest interaction. We met a number of very interesting people and made what will probably turn out to be lasting relationships. 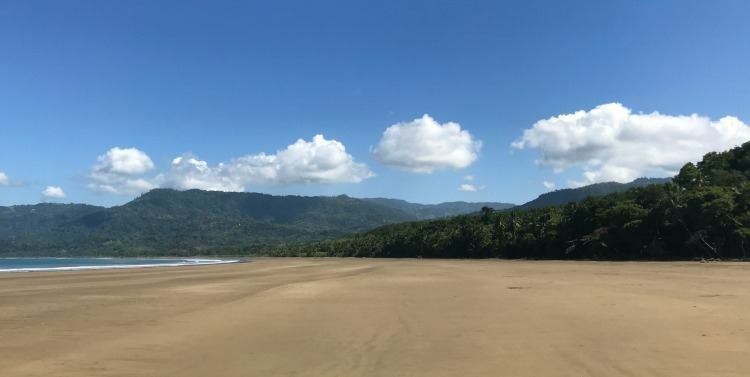 The hostel is within easy walking distance to Uvita but the nearest beach is a long walk … about 5 k's … or short $4 taxi ride away. The beach has a very unique feature in that at low tide it looks like a whale's tail. We went down early one morning and even at 8 o'clock it was very hot. After paying the entrance fee of six dollars we walked to the end of the tail and then after a swim took refuge under a palm tree. The beach is very impressive to see but the sand is fine and quite muddy. There is a waterfall and river close by which are perfect for a swim … the waterfall has the added attraction of a challenging rock slide! We went on a long morning walk to find a reasonably accessible view of the 'whale tail' beach. After taking a wrong turn we eventually found it … but it was very disappointing. Most of the view is hidden behind a large white house. The other alternative is to take a very long apparently around 4 km steep walk up past the waterfall where one can get a birds’ eye view of the 'whale tail'.